I am a sucker for scented candles and have them all over my home. There’s nothing better than a sweet scented fragrance wafting in the air. My favourite way to relax is to curl up with some candles burning and a good book in hand. My favourite types of candles are the ones made from soybeans so I was stoked to be able to review some soybean tart chunks from SoyLicious.com. 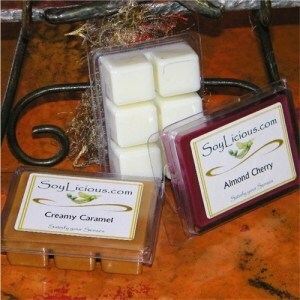 SoyLicious.com makes premium soybean wax candles and tart chunks from two types of American grown soybeans and uses natural botanical oils to give them their vibrant colour and creamy texture. Their candles are hand poured to order and the customer will never receive a candle that has been sitting in inventory for months on end. I like the idea of a candle being freshly made to order so that you can ensure top quality and freshness. Not only do the make candles and tart chunks, but you can also find Room Sprays, Electric Wax Melters, Plug In Warmers, Reed Diffusers and Soy Soaps…everything you need to make your home smelling wonderful! You should see the selection of scents! I am partial to the food ones like Pumpkin Spice, Vanilla Extract, Hot Apple Pie, Creamy Caramel, Cinnamon Buns, Cafe Latte…anyone hungry yet? Plus with the Tart Chunks, you can combine two fragrances together. I am thinking that Hot Apple Pie and Creamy Caramel would smell amazing together! Mary Reid, one of the Founding Consultants of SoyLicious.com, sent me three different tart chunks for review in Banana Nut Bread, Mulberry and Sunwashed Linen. I tried them all in my tart burner that I have at home and wow do they ever smell awesome!!! The Banana Nut Bread is my favourite of the three (although the other two are great too!). My house smelled like I had been baking all day (like that would ever happen!) and the wonderful and delicious fragrance permeated the house. I was impressed by how far it reached. I would love to try their other yummy scents. I am now a big fan of SoyLicious.com. I want my mom to smell the Sunwashed Linen tart chunks next time she comes to visit. That is her favourite scent and I know she will love it. It reminds me of fresh laundry hanging on the clothesline on a bright, sunny day. The tart chunks are $3.95 each. Great price for a great product. Check them out! 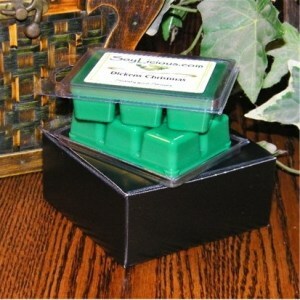 I would love to try out the Soy Soap in the lavender thanks for such a great contest I too am a big sucker for candles and tarts and the soy are the best hubby complains when I burn the wax ones he says they burn his eyes but I can keep the complaints at bay with the soy ones. The Spa Candle in Sparkling Citrus scent sounds great! I follow Satisfy Your Senses on Google Friend Connect. I’d also like to try their oatmeal milk&honey soap.